The building served originally as a home for Roman Catholic women and girls. On the lowest level were the communal rooms and the main entrance in the right-hand section. Upstairs was mainly given over to the 158 bedrooms reached from a corridor. Each level had its own colour internally: white, green, crimson, blue-green and grey. The upstairs facilities such as washroorns, a sick bay and a chapel were mostly located at the corners of the U-shaped building. 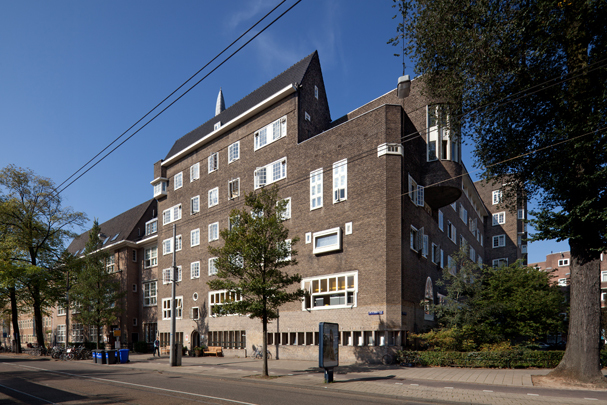 This main statement is clearly expressed in the frontage by striking forms and fantastic window shapes typical of the Amsterdam School. The building is now a local centre.